A totally new dimension of performance in efficient effective air movement, plus capability, quality and durability just not seen before this type of equipment. 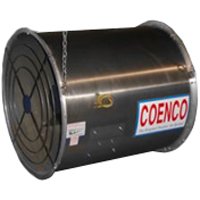 One Coenco Real Air Mover replaces 3 to 5 of the usual 36″ and 42″ fan on wheels. In addition to energy savings and real value for energy dollars spent, the Coenco Positive Air System® saves up to 75% on equipment, utility service costs, and maintenance expense. Motors: Single or 3 phase available. All motors are custom made for Coenco, single or 3 phase with thermal protection so that no starter or fuses are necessary. Full 5 year motor warranty & another 5 year limited motor warranty for normal use.